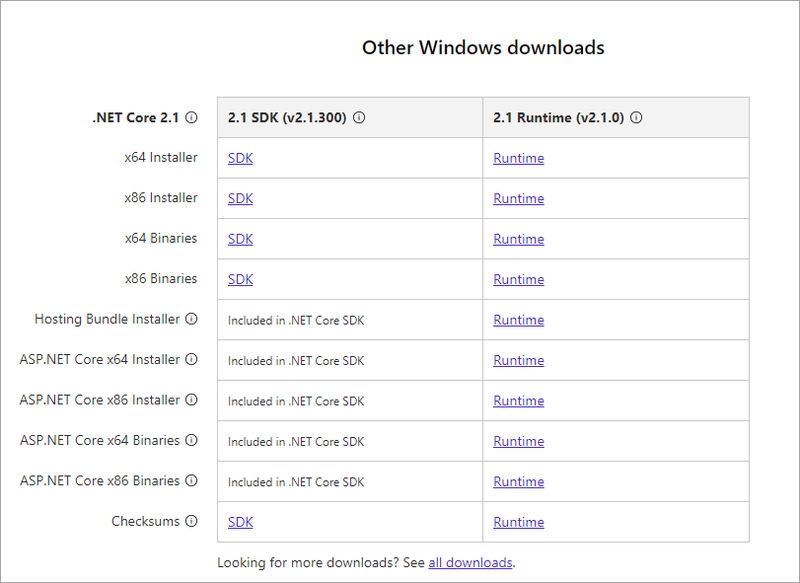 .NET Core has a number of different runtime downloads that you can grab to install the runtimes and the SDK. It's not immediately obvious what you need, so since I just went through this myself and had a discussion with a few folks at Microsoft (thanks @DamianEdwards and @RowanMiller). I thought I'd summarize if for nothing else than my own reference in the future since I seem to forget what I figured for the last release 😃. If that doesn't work and you get an error, it means that .NET Core is not installed at all. dotnet.exe installs as part of a runtime install and puts itself on the path so you should be able to do dotnet --info if it is installed. dotnet.exe installs with a runtime install, but it only provides core features to provide info to run and application and provide info about the install: dotnet mydll.dll and dotnet --info. To build, publish or do anything else you need to install the SDK. Generally, there should be no need to use a specific lower SDK version as the SDK is backwards compatible and can compile various versions of .NET Core applicatino back to v1.0. IOW, it's OK to use the latest SDK in almost all cases. If you're on a Windows you're very likely to be using Visual Studio and if you have the latest version of Visual Studio installed you are likely to have the latest SDK, runtime as well as the required IIS hosting components installed. If you're using Visual Studio you typically only need to update the components below if you need to target a specific version of .NET Core that is not already installed. If you're doing active development, the most likely scenario is that you'll be upgrading to the latest version anyway which is most likely going to match what Visual Studio installed. The SDK is meant for non-Visual Studio build and management tasks. That's for command line use or if you're not on Windows specifically. The SDK basically provides what you need for a development setup to build and run .NET Core and all dependencies. The SDK is the largest download and it contains everything you need for a given platform. 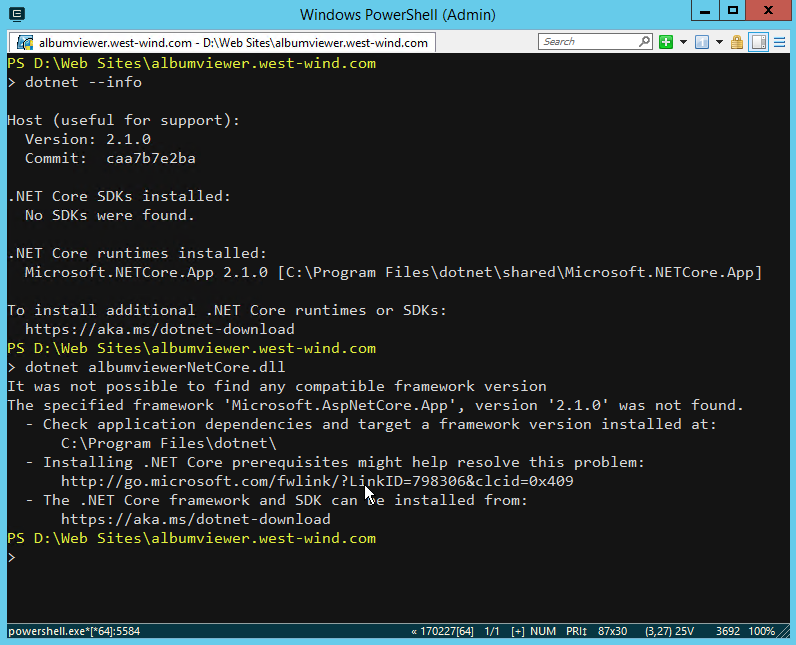 Effectively it installs the dotnet.exe build tools along with support components. 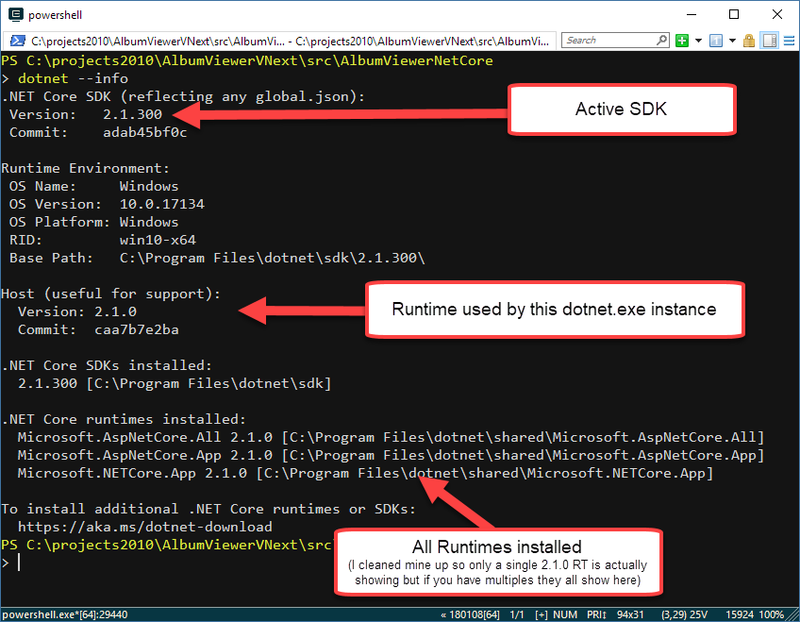 The SDK also installs a fixed version of the .NET Runtime with it which is required to run the SDK tooling. In other words if you download the latest SDK you typically also get the latest runtimes and you don't have to install the matched runtimes separately. The versions are .NET Core SDK 2.1.300 and .NET Runtime 2.1.0 as shown in the figure above. The .NET Core Runtimes are the smallest self-contained and specific component and contain the absolute minimum to run just .NET Core on a specific platform. 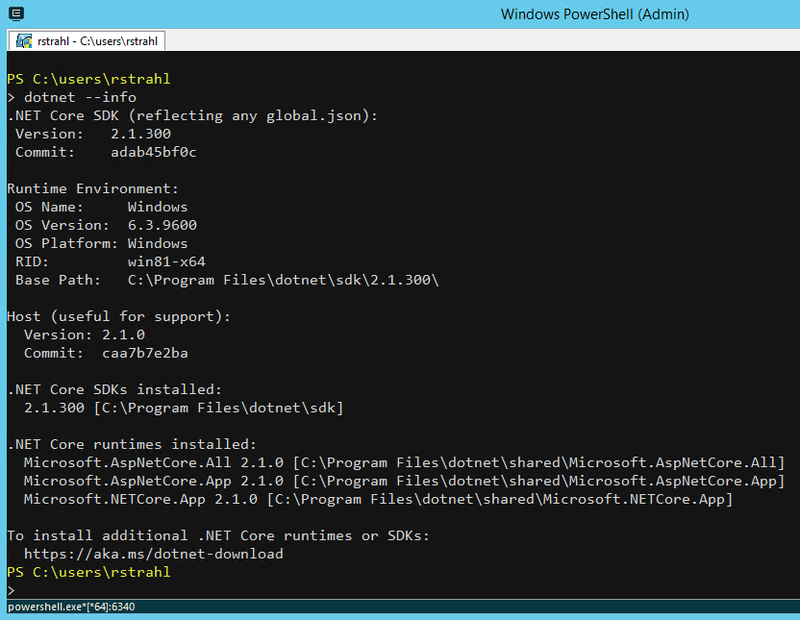 Note it a runtime install does not include the ASP.NET Core meta package runtime dependencies, so if your application references Microsoft.AspNetCore.App or Microsoft.AspNetCore.All you have to seperately download the ASP.NET Core package. However, if you explicitly reference all ASP.NET Core Nuget packages rather than using the meta packages, those packages are deployed as part of your application and it can run with just the runtime. Essentially you are trading installation package size vs. a runtime pre-install requirement. The runtime alone has no support for dotnet.exe beyond running and info, so you can't build or publish - whatever you use the runtime for has to be a completely pre-compiled and be able to run as is. Does not include the ASP.NET Runtimes! This package basically installs the missing ASP.NET Runtime meta packages that the base .NET Core Runtime package described in the previous step is missing. Basically this installs support for the ASP.NET Core meta packages. As you can see so far the SDK and Runtimes by themselves are usually not the right tool for deployed applications because they don't include everything you need and for this reason - at least on Windows there's a special Hosting Pack download that contains everything you need to run an ASP.NET Core application on Windows. This is perhaps the most confusing of the packages available because the naming doesn't really describe what it provides. You can think of this package as EVERYTHING except the dotnet SDK tools. This package installs both 32 and 64 bit runtimes, the ASP.NET Core Runtimes as well the IIS hosting components on Windows. If you need the SDK tools you're better of just installing the SDK instead of this package. The Windows Hosting pack is specific to Windows and there are no commensurate bundles for Linux or the Mac. On Linux/Mac you can use the SDK download for Dev machines, and .NET Core Runtime + ASP.NET Core Runtimes for typical installations. That's a lot of options and frankly every time I install or update a version I forget what exactly I should install. Microsoft recently updated the download page to make things a little bit easier to understand. Note the info icons and the included in .NET Core SDK notes, which highlights that if you install the SDK you pretty much get everything. # re: Which .NET Core Runtime Download do you need? Thanks for this immaculate summary of Core .Net installation packages! I happened to install the 'Hosting' package on my web server just 1 day before I stumbled upon your post about it. Do you think this is a/the good choice for a web server? Or have you chosen a different install on your webserver(s)? Thank you for your information. Honestly, I'm quite confused which version need to be installed. I test .net Core 2 on my localhost and it works. But, when I deployed to my hosting (Asphostportal), it is not stable. Sometimes it will work fine, but sometimes it will throw an error. Is there a bug on .net core? Just curious. Thanks for the excellent breakdown. This is something I have to be mindful of constantly. Our organization leverages several cloud platforms and even has an internal Cloud Foundry implementation. With Cloud Foundry, I find myself constantly having to be mindful of SDKs and runtimes and have to use the global.json to ensure that what I'm building locally can actually be pushed into a Cloud Foundry container based on what dotnet core buildpack has been applied on the servers and what versions of the SDKs it supports. I know that using the global.json may not be a common use case but it's sure convenient when you need it! To clarify - when a server shall host both .Net Core 2.1 applications and .Net Core 2.2 applications, hosting bundles for both versions must be installed, right? @Björn - if you have both 2.1 and 2.2 applications you can install only 2.2 as versions will roll forward within the major version (only to 2.99). But to be safe - yes you'd probably want to have the version you built against installed.